1st Revelation Tattoo is Weatherford’s premier Christian owned tattoo shop located at 1716 Fort Worth Highway, and is owned and operated by artist Tod Bain and his wife, Wendi. We offer professional, custom tattooing and body piercing in a sterile and comfortable environment. With our name derived from the book of Revelation in the Bible, our goal is to set a different standard for our clients than what they might experience at other tattoo shops. We focus on operating our business with morality and providing an environment for everyone to feel welcome. Getting a tattoo should be a positive experience and we pride ourselves on being able to provide that for our clients. You’re not just getting a tattoo, you’re getting a permanent piece of living art! Our artists are experienced and specialize in a variety of different genres of tattooing. They each have their own unique and personal style which means no matter what kind of tattoo you want, we can deliver. But we don’t want you to just take our word for it. Check out their portfolios! You can lurk on each artists portfolio in our gallery, or better yet–come into the shop and flip through their books and talk to the artists themselves about making your appointment today! Thanks for checking us out. You are already one step closer to awesomeness. At a very young age Kristin grabbed a pencil and a blank piece of paper and went to town. Art was more of a right of passage than just an interest of hers, coming from multiple generations of artists and skilled craftsman. As a young lady her art teachers became interested in her art work and began to pay a little extra attention to her in classes throughout the years. Through the twists and turns of her older years she finally found herself in the tattoo industry with the encouragement of her dear husband. After a little bit of practice on her loyal friends and family, Kristin inquired about an apprenticeship from some amazing artists on her travels which eventually led to the great state of Texas. As a new artist she is grateful for the opportunity to gain the trust and relationship of her clients. As she grows and progresses as an artist and a wonderful person in the industry, her hospitality and love for the arts have generated a good following of loyal clients. Kristin’s dream is to become a successful photo realism tattoo artist accompanying by her skills in charcoal and graphite pencil portraits. 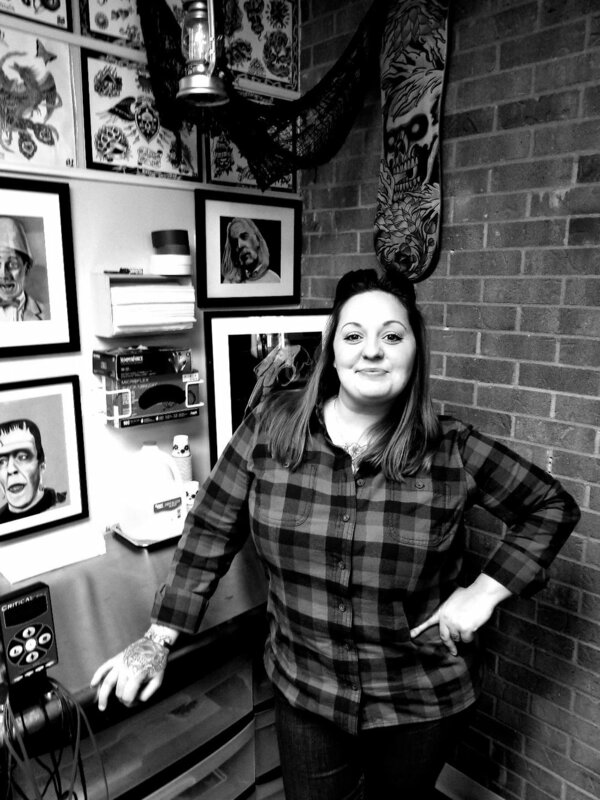 Without a doubt her determination, ambition and amazing skills she will make her mark on the tattoo industry. Come meet her for yourself.